Bezawit Tadesse (right) and Frehiwot Bogale (left) both delivered their babies in the hospital’s refurbished maternity ward and have returned for a follow-up visit with questions about breastfeeding. Hosanna, Ethiopia—As the community in this southern Ethiopian township grew, the historic hospital in its midst declined. Despite early support from local families and businesses, Nigist Eleni Mohammed Memorial Hospital had deteriorated to a point that patients couldn’t be assured they would find sheets on the beds. Farmers, merchants and families helped build the hospital in 1980 with their contributions, creating a bond and allegiance to the institution. “The community feels that the hospital belongs to them and is part of Hosanna’s heritage,” explains Berhanu Ersesi, the current president of the Hosanna Chamber of Commerce. Recognizing those deep ties, in 2011, the hospital’s board of directors decided to launch a campaign to improve the hospital’s conditions. That August, with support from the U.S. Agency for International Development, the Maternal and Child Health Integrated Program (MCHIP) began working with the hospital staff and introduced a quality assessment and improvement method to strengthen hospital operations. The staff chose maternal and newborn health services as the first area in which to apply the method, referred to as Standards-Based Management and Recognition (SBM-R®). Pioneered by Jhpiego, SBM-R is a practical management process for improving the performance and quality of health services. It focuses on streamlined standardization and implementation of best practices. Today, the Nigist Eleni Mohammed Memorial HospitaI serves a catchment area of 1.4 million people. The hospital and 60 rural health centers make up the health facility network in Hadiya Zone, in the Southern Nations, Nationalities and Peoples Region of Ethiopia. During September–November 2012, following implementation of SBM-R in the zone, 25 percent of women gave birth with a skilled birth attendant, up from 6 percent during the same time period in 2011, and 50 percent of pregnant women attended at last one prenatal care visit, up from 42 percent in 2011. Under the leadership of the medical director, Dr. Ayano Shanko, hospital and MCHIP staff used SBM-R to identify and assess gaps in clinical services in the hospital’s maternity unit and then to prioritize the gaps they could address. The SBM-R assessment stressed improving the management of resources at the hospital and in the community, updating staff skills and knowledge, and strengthening hospital leadership. Through this process, the hospital connected with community leaders, business owners and former residents to engage them in helping address the facility’s needs. And the community responded, raising $5,000 that was used to buy 250 sets of sheets, blankets and pillows, along with two refrigerators to store blood and heat-sensitive medicine. “The SBM-R process showed us that there are many ways to get the support we need,” said Dr. Ayano. Next on the list for Dr. Ayano and his team was the hospital’s maternity ward. As a result of the facility’s deterioration and the increasing demand for services, the original maternity ward was too small to accommodate the number of patients who came for care. Pregnant women and mothers giving birth were placed in the same narrow room, which lacked windows and ventilation. In addition, mothers in need of emergency cesarean operations had to be carried across the hospital compound, wasting precious minutes and putting lives at risk. Using SBM-R as a blueprint, the hospital team relocated the delivery ward next to the operating room. They also created separate rooms for antenatal, delivery and postnatal care. In addition, the ward tripled the number of delivery beds to 12. Now, the 400 mothers coming to the hospital every month for delivery and emergencies no longer have to wait for a bed. To ensure that the renovated maternity ward was appropriately outfitted, the hospital requested essential equipment from the government. Regional and zonal health bureaus gladly complied, contributing operating tables and a suction machine. The neighboring Hawassa University Hospital supplied the anesthesia machine, and international donors helped upgrade facilities by painting the new maternity ward and providing structural improvements to the hospital buildings. “The SBM-R document allowed us to identify our needs and encouraged us to figure out what the government can do, what the donors can do and what we ourselves can do,” Berhanu, of the Chamber of Commerce, points out. To encourage the hospital to continue its improvements, MCHIP provided the maternity ward with delivery kits, two postnatal beds and videos to show health education messages to mothers recovering after birth. And, as part of their contribution, Dr. Ayano and his team built partitions between the delivery beds using sheet metal found in hospital storerooms. 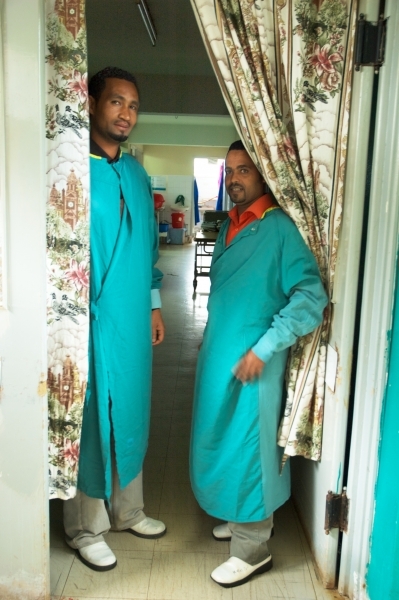 Two nurses stand in the maternity unit at Hosanna hospital, which was renovated as part of the SBM-R process. The SBM-R assessment also addressed staff needs. As part of the standardization of staff skills, Tseganesh Bekele, the chief midwife in the maternity ward, and another midwife attended an MCHIP training in basic emergency obstetric and newborn care. They then shared with colleagues their new knowledge on how to manage birth complications associated with postpartum hemorrhage, infection, shock, eclampsia and newborn asphyxia. Tseganesh also had noted in her SBM-R analysis that midwives burned out quickly due to a stressful workload, which led to a high turnover rate. To help address this issue, the hospital increased the number of midwives from 10 to 16.